Review by Sir Nick on 3/17/2012. The game starts slow, would need more then 5 armies to get anywhere fast. The bonuses are too large; and on top of that, you can be come crippled by losing one territory. Once you get one bonus, your set. The biggest problem is that fact that all of the territories are labeled with numbers. These places have names, the townsfolk are probably quite enraged by this. The only nice thing about this map is the look, it's well drawn. I probably would of abandoned this game without cards to spice it up. Review by John The Conquerer on 3/29/2013. Good map. I get tired of maps that have choke territories. i like the open fighting. 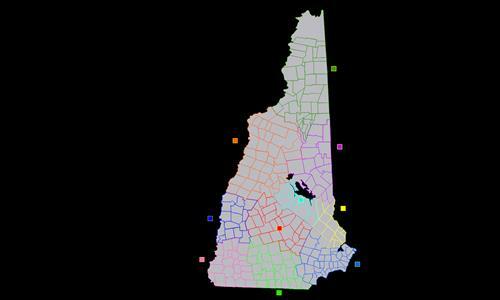 Only negative is that the territories are numbered and not given NH town names. I agree with previous posters that the bonus regions are simply too large. They also vary too widely in size. It's much easier to take the 13-territory bonus than the 40-bonus territories, and once you do, conquering a player who is still gathering his/her bonuses is child's play. I recommend breaking these areas up into regions of no more than 10. You can retain the current bonuses (albeit probably with a lower bonus value) as superbonus regions. Review by chaseelias on 6/16/2015. It was a good map. The detail was amazing.